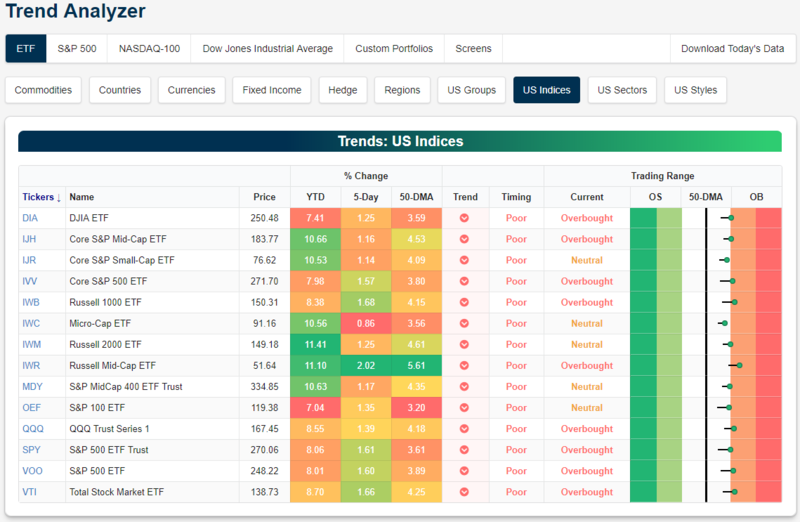 Heading into the first full trading week of February, major index trends are looking quite different from the extremely oversold conditions of one month ago. With last week’s gains adding to the list of overbought names, currently, there are 9 ETFs in this group that are overbought while the remaining 5 are all still neutral; though it won’t take much of a move higher to allow these neutral ETFs to join their peers and vice versa. Only the Russell Mid-Cap (IWR) is firmly sitting in overbought territory as it is coming off of strong momentum over the past week, rallying over 2%. The next best performer is the Russell 1000 (IWB) at 1.68%. The Russell 2000 (IWM) still leads the pack YTD with a gain of 11.41%.